The Retirement Café: But What If You Do? People nearing retirement age often tell me that they plan to claim their Social Security benefits at the earliest possible age of 62. More often than not they’ll explain that they would have to live 15 years or so, to age 77 or 78 depending on individual circumstances, to come out ahead. Someone told them that is their "break-even age" for Social Security retirement benefits. They go on to explain that they don’t expect to live that long, though for the life of me I can’t figure out how a reasonably healthy person would know how long he or she will live, or why they would be willing to bet a lot of money on it. At a baseball game last summer, one of my buddies looked around and asked, "What's the break-even age for Social Security benefits?" A partner from a CPA firm answered, "Around 78-80 depending on your specific situation." "Huh!" he grunted, turning back to the game. "I'm not gonna live to 80." Consider Fred and Ethel, a married couple in their 60’s. Fred would be eligible for Social Security benefits of $1,735 monthly if he received them at age 62, or $2,300 if he waited until age 66. If he could postpone receiving benefits until age 70, he would receive $3,030 a month for the rest of his life, a whopping 75% more than if he claimed at the earliest age. Fred plans to claim at age 62 because he thinks he won’t live a long life. He’ll come out ahead in lifetime benefits if he claims early and doesn’t live past age 78 or so. But what if he does? The following chart shows Fred's total lifetime payments from Social Security retirement benefits if he lives to various ages and claims either at age 62, 66 or 70. 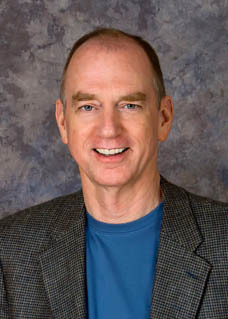 For example, if he claims at age 62 and dies at age 76, he will receive payments totaling about $312,000 over 14 years. Should he claim at age 66 and die at 76, he would receive about $304,000. To simplify the chart, let's divide it into three sections, or three possible future scenarios for Fred. First, look at the middle section when Fred is around his break-even age of 78. If he dies within a few years either side of age 78, all three claiming ages work out about the same for him, so his benefit-claiming age decision wouldn't have a big impact either way. Next, let's look at the early retirement years preceding the middle section. In these years, Fred will either have a short-term and urgent need for his benefits because he has limited income and savings, or he will have the option to transfer some early retirement standard of living to late retirement. He would do this by postponing his claiming age. That would give him less income in early retirement and more in late retirement, should he live that long. Regardless, if Fred doesn't live past early retirement he is clearly better off claiming early, but his spouse may not be. Ethel's survivors benefits will be 100% of Fred's retirement benefit at death.1 If she survives Fred, she will live the rest of her life with the lower benefit that Fred chose for her by claiming his own retirement benefits early. 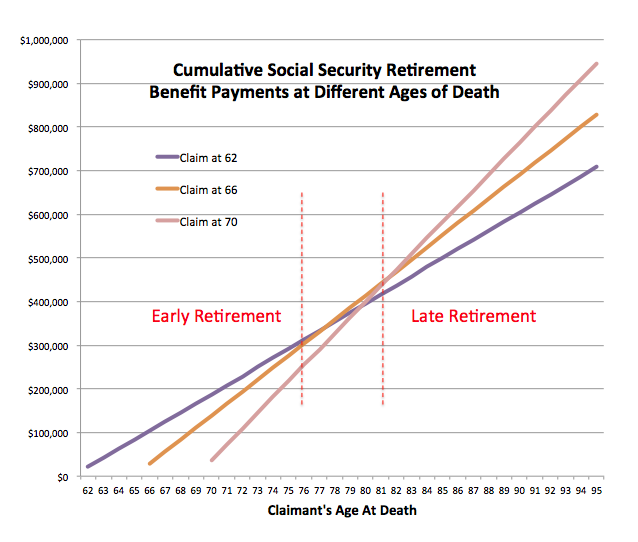 If Fred lives just a few years after retiring he will receive more total benefits if he claims early, but the opposite is true if he lives a long life. So, which should he bet on? A short retirement is relatively less expensive than a long one, and often a lot less expensive. A short retirement requires less savings. It may be possible to return to work if you run low on funds early in retirement. A long retirement is far worse from a financial perspective. It costs a lot more. You're too old to go back to work. You've probably depleted most or all of your savings. You'll need some of that early retirement standard of living more in your old age than you needed it in early retirement. Running out of money in late retirement is the worst-case scenario and a good financial planner would insist on taking the worst-case scenario off the table. So, Fred believes that he and Ethel won't live a long life, but what if they do? They would be much worse off claiming benefits early and living a long time than claiming later and living an average lifetime or less. Break-even ages would be interesting if they showed that you would have to live to 105 to break even (everyone would claim early), or if you only had to live to 64 (everyone would wait), but they don’t. They show that you must live to an age that you might reasonably expect to attain and that you might not. Consequently, I find break-even ages relatively useless. How about investing your retirement savings in the stock market? The “4% Rule” strategy for investing retirement savings in stocks says we have a 95% chance of not outliving our savings. That’s great if you don’t end up in the 5% group of retirees who go broke, but what if you do? Those web-based retirement calculators show you what will probably happen to most people. They don't show what might happen to you. Anticipating the worst-case financial outcomes and planning to avoid them, even at some cost of our retirement standard of living, is what we call risk management. Break-even analysis isn’t risk management, nor is betting on future stock market returns. It’s betting that everything will work out fine. It’s playing the odds that we (and our spouses) won’t live longer than an average lifetime, that inflation won’t run away, and that the stock market gods will smile on us. Perhaps you and your spouse won't live longer than average lives. Maybe inflation will remain below 3%. Maybe you won't experience a long-term bear market after you retire. 1 Assuming Fred has begun receiving those benefits, otherwise it will equal 100% of his retirement benefit at full retirement age.